Texas isn’t the only place affected by heat and drought. August was yet another busy month for global weather extremes. Highlights included record-busting heat and drought (again) in the south-central portions of the U.S.A. The climatological summer of June-August was the 2nd warmest since accurate measurements began in 1895. An intense heat wave also affected southern Europe in mid-month. Severe tropical storms lashed the eastern seaboard of the USA (Irene) and the Philippines and Japan. Torrential rains caused devastating flooding and landslides in Nigeria and Uganda. But the 2nd most important extreme weather story (2nd to the USA heat wave and drought) was the record cold wave and blizzard that hit New Zealand on August 14-15. Source: Weather Extremes : August 2011 Global Weather Extremes Summary : Weather Underground. 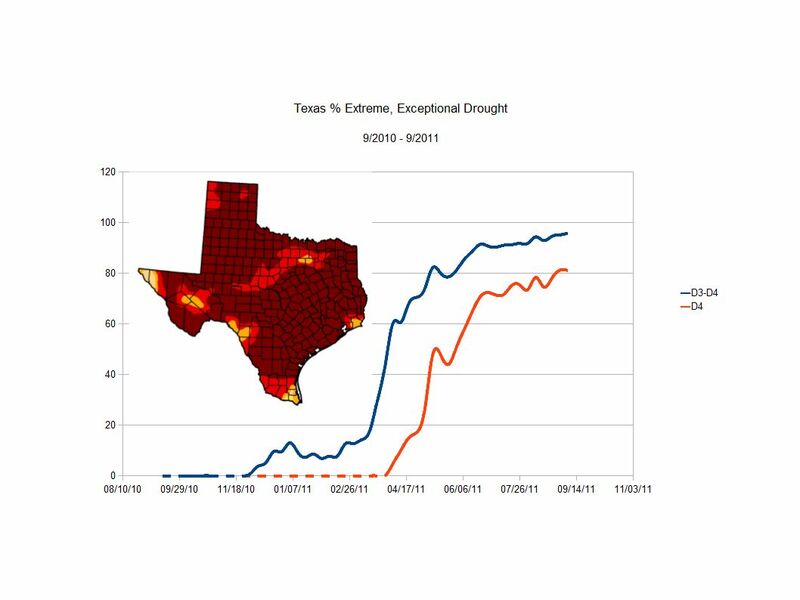 This drought and summer-heat is still going, and may continue until summer 2012. It did cool off last week though – lows in the mid-50’s, highs in the low 90’s – but we’ve only seen 1 inch of rain since August 1. That cool off is 2 weeks ahead of schedule. Usually we have a cool spell during the 3rd week of September. Since January 1, state and local firefighters and crews from across the country have battled 18,887 wildfires over more than 3.5 million acres in Texas, according to state officials. Source: More wildfires erupt in Texas as it faces worst dry spell since 1895 – CNN.com. Back in June I reported about Global Weirding and the number of counties in exceptional drought. Well, as expected, the trend continued into September. As of September 6, 81% of counties are in exceptional drought – the worst on the Drought Monitor’s scale. 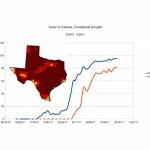 This entry was posted in Nature and tagged drought, fires, heat, Texas by Chris Siems. Bookmark the permalink.